Thanksgiving Day is held on the fourth Thursday in November, and this year it falls on Thursday November 23rd, 2017. 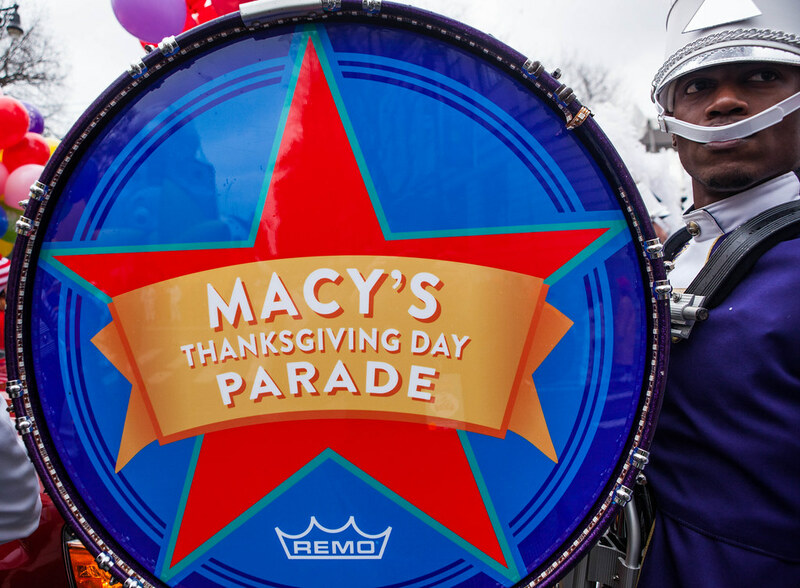 The holiday is a magical time in the city – and the centrepiece of the celebrations here is the Macy’s Thanksgiving Day Parade, which starts at 9am ET on…well, Thanksgiving Day. The parade attracts tens of millions of TV viewers each year – tuning in from across the USA and the world. However, there is nothing quite like watching it live from the parade route. It’s entertaining, exciting and iconic – and the city itself is a magical place at this time of year. It is the ultimate Thanksgiving experience in New York for locals and visitors alike. To watch the parade, you do need to be prepared. The route begins at Central Park West and 77th Street, and heads around that side of the park and down 6th Avenue to 34th Street and Macy’s Herald Square. There’s 2.5 miles of public viewing space, but going on my experience of previous years, this will fill up quickly from 7am or before, so get up and out early if you want to grab a good spot to see the action. It’s a good idea to put some thought into where you will stand along the parade route. Obviously, the further down the parade route you are, then the longer the event will last. I usually stand up towards the Upper West Side or as close to that area as I can get. Here, momentum dictates that the parade will last around one hour and a half. Further down the parade route it lasts around 3 hours, and although great fun, it’s a lot more crowded, especially near Macy’s. If you’ve not been before, then expect an amazing show of festive celebration. The parade is famous for its balloons. Giant balloon representations of some of your favourite characters from the world of film and TV will make their way along the parade route – and you can’t miss them. Literally. This year’s line up includes – Angry Birds’ Red, Power Rangers, Scrat from Ice Age, Trolls, Spongebob, Pikachu, Charlie Brown and the Pillsbury Dough Boy. 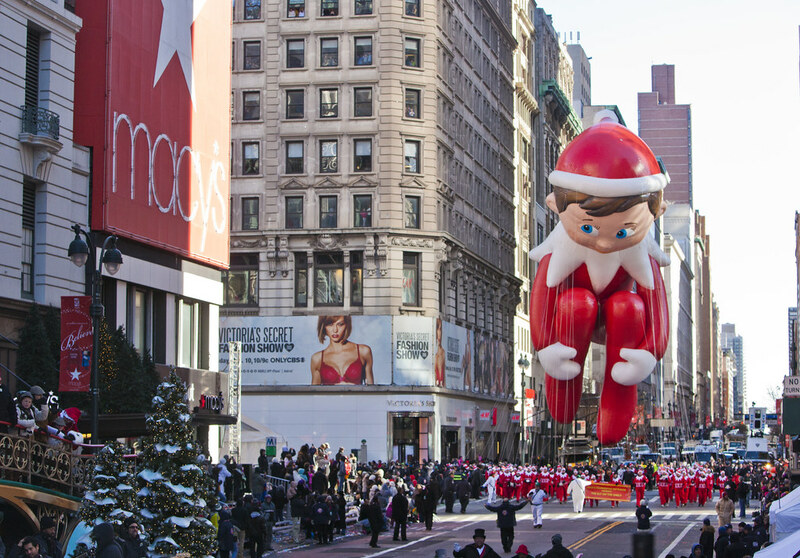 The gigantic balloon version of the Elf on the Shelf will also be there to keep an eye on everyone. There will be incredible floats, clowns, circus and street performers too – and all of this will be set to the music of around a dozen marching bands from all over the country. 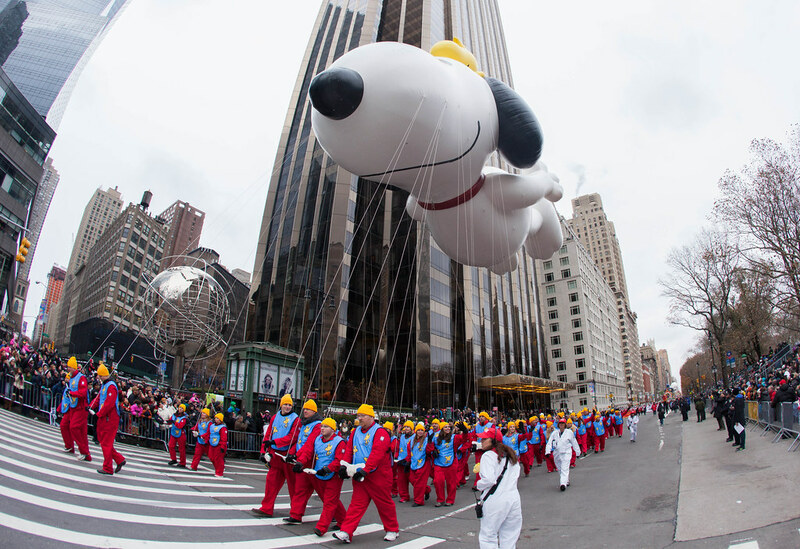 Macy’s Thanksgiving Day parade is a huge event in NYC – so much work goes into it. If you happen to be in town on the day before Thanksgiving Day, then try to catch a glimpse of the balloons being inflated at the staging area – which usually takes place on the Upper West Side, near the American Museum of Natural History. It’s a superb photo and selfie opportunity! I love seeing these balloon masterpieces coming to life each year – usually from mid afternoon onwards on the Wednesday before. 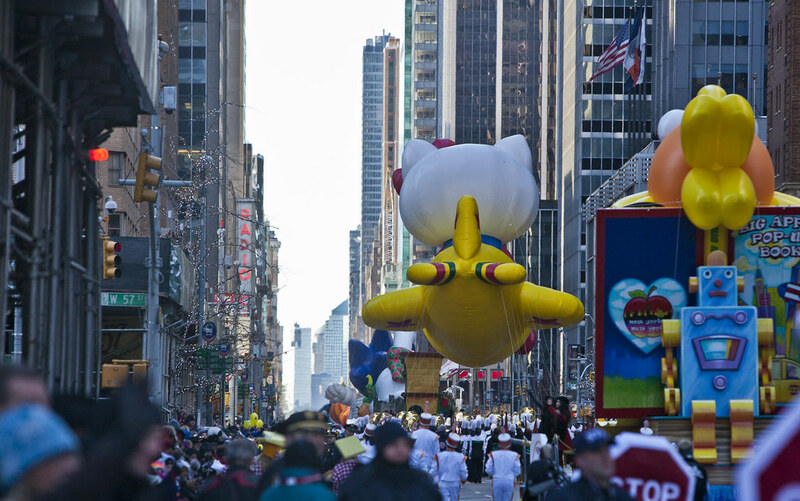 Finally – a few general insider tips for your trip to the Thanksgiving Day Parade in New York. Remember to wrap up warm – take layers, hats and gloves, as the city is cold and weather is changeable in November. Be sure to take drinks and snacks along too as you won’t want to lose your spot once you’ve got it. Also – if you have little people with you, try to work out where the nearest restroom will be. Also, I follow @MACYS on twitter on the days leading up to the event for parade updates too. Once you’re done at the parade, there’s still a host of fun to have in New York City during Thanksgiving – it is the start of the holidays after all. At this time of year, New York is dressed for the holidays in the most spectacular way – so hop on board one of GrayLine New York night tours to see the twinkling lights all over town. Or, check out the city’s Christmas Markets, or iconic ice skating rinks like the 17,000 square foot Winter Village at Bryant Park. If you want to be indoors, the Radio City Christmas Spectacular is an annual highlight. The Macy’s Thanksgiving Parade is an absolute must if you are in NYC over the holiday. The holiday atmosphere it invokes, as well as the giant balloon creations floating along the New York City streets will stay long in the memory. Before I sign off, remember to check out our FreeStyle Pass New York – where you can have unlimited service on our Hop-On Hop-Off buses as well as entry into your choice of three, five or seven NYC attractions – a perfect way to maximize your time whilst in New York. Visit our website at graylinenewyork.comfor more details on how we can help you tour New York City.